Pragmatic Marketing’s 2007 survey of product managers includes questions that identify product managers as having technical backgrounds. Product management involves many responsibilities that require some level of technical acumen. In this article, we look at the survey responses to see if the degree of technical skill has a correlation with compensation. We looked at three different inputs for comparing the compensation data. We looked at reported level of technical expertise, years of experience, and job title. To determine total compensation, we combined reported salary with reported bonus. This removed people who reported 0 years of experience or left the field blank. We excluded those people who responded with “other” from this analysis. We determined total compensation by adding the reported salary to the reported bonus amount. We did not analyze the bonus mechanism (stock vs. cash, etc). First, we looked at the compensation versus years of experience – sorted by job title. 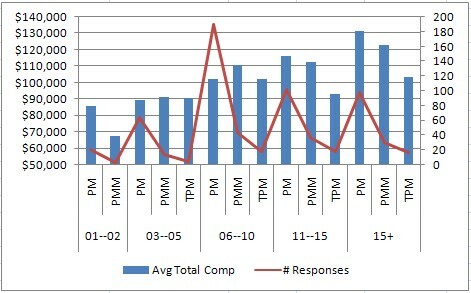 The red line represents number of respondents against the right axis, and the blue bars show average total compensation against the left axis. Then we looked at the breakout of compensation by technical level – again, sorted by job title. The red line represents the number of responses (against the right axis) and the blue bars show total compensation against the left axis in USD. Technical product managers, at least the more senior ones, are paid less than non-technical product managers – when looking purely at titles. However, product managers with technical skills are generally paid better than product managers without them. One interpretation of the data might be that while technical skills help you earn more in any product management role, the technical product manager role generally earns less – perhaps due to perceived scope of responsibility or impact.